Remember to check your attic!! Checking your attic should form part of a routine house maintenance program. The attic is a great way of checking for roof leaks and doing this on a regular basis means that any leak will be detected before it can do major, and costly, damage to your roof structure. Especially check around chimney and skylight penetrations as these have a higher chance of providing locations for water ingress. Attics in the Pacific North West can also be prone to organic growth (mould, mildew etc), usually on the roof sheathing with the North facing side being particularly vulnerable. Mould/mildew spores surround us and are part of life. Look at what can happen to a stale piece of bread or fruit. In order for spores to germinate, three things are required. The first is a food source (in an attic this is usually wood sheathing), the second is the correct temperature and finally – moisture. Remove any one of these three requirements and the mould growth ceases. The only thing that we can control with any certainty is moisture and this is contained in the air. So the best way that we can prevent and control mould growth in attics is to reduce moisture levels. So why do we need to check our attics a part of a preventative maintenance program? In some houses, both the bathroom and dryer vents run through the attic and vent via the roof. If these become loose or detached from the roof, then the warm moist air contained in the exhaust discharges into the attic and provides two key ingredients for mould growth to thrive – moisture and heat. So please check the exhaust vent connections for air leakage and make sure the connection at the roof is in good condition. 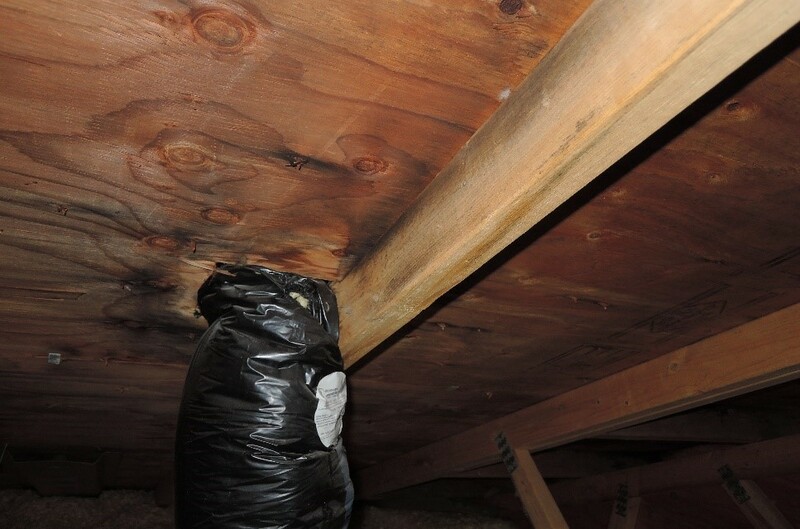 The photograph below shows a recent air leak from the insulated exhaust duct – note the dark staining on the roof truss and plywood sheathing around the exhaust duct. This has been caught in the early stages before costly repairs were required. If your dryer or bathroom exhaust vents are configured to discharge in the soffit area (the underside of a roof overhang), moisture-laden warm exhaust can be blown back into the attic via the vented soffit. This is dependent on the wind direction in relation to the vent termination point. Should you find black staining in the attic close to the vent termination location, the easy solution is to blank off the soffit vents 3’ either side on the exterior surface. Another strategy to deal with mould growth is to increase ventilation in the attic. Good air flow can vent moisture-laden air from the attic before condensation can occur. In older houses, there can be several layers of attic insulation. What can happen is that insulation can be forced up against the roof sheathing and this can severely restrict or block air flow from the soffit vents. If you have this condition in your attic, a quick and cost-effective solution is to install air ducts/baffles. The photograph on the left shows them fitted. These are specifically designed molded lightweight plastic sections that simply push fit between the insulation and roof sheathing and restore and maintain air flow from the soffit. With most new construction that have attics, air ducts/baffles are usually fitted. Finally, when you leave the attic, check the access hatch. It should be insulated and weather stripped. 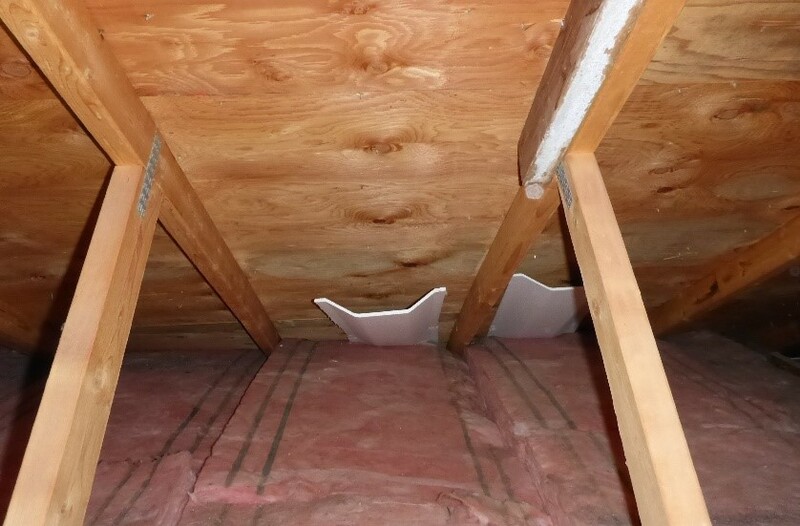 You would be surprised how much moisture-laden air can enter an attic via the hatch. "Mark and Gerrie were terrific: their work is very thorough and super professional." 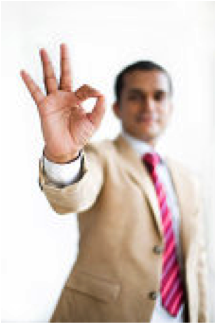 "Incredible service, very accommodating, test 1 test 2 test 3"